This necklace is looked complexed, but not so hard to tie. Containing just 3 basic knots in 2 colors, you will get the beautiful tribal looks necklace. Moreover, along the way you tie the knots, you will learn the basic fundamental for creating your own work. *** I take these pictures while i do this necklace on my first time, so the pictures may not perfectly tell everything. So it is more important to follow the instruction below the pictures. 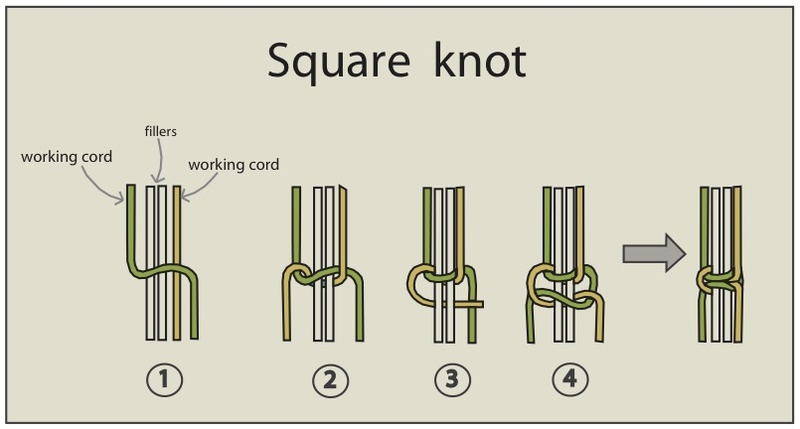 Before working this project you must practice these knot. Instructions: There are 2 structures making this work, first you make pendant part around the necklace line , second you make the necklace line on left and right side. Fold every cord into a half to start every thing at middle. Secure 3 brown cords(100 cm) horizontally. This is a holding cords for necklace line part. Use 10 cords ( 8 orange and 2 brown,90cm.) for working cord. Tie larks head knot on necklace line part, arrange the brown knots in the middle. Start with left group. Tie the double half hitch bar, the holding cord will be on the leftest, tie the holding cord to the right. 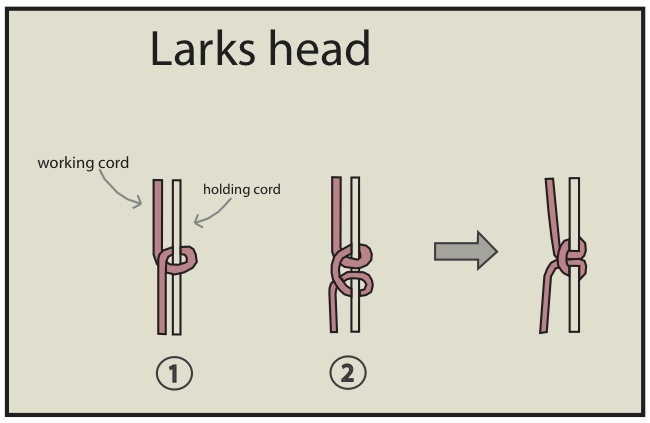 Make sure that each knot is closed to larks head knots above. Then work on the right group. Tie the double half hitch bar, the holding cord will be on the rightest, tie the holding cord to the left. Now the holding cord on the left and right group are in the middle, tie them in the square knot without filler. You just complete the first row. Tying the second row same method with the first row. On left group, work on cord 1-6. Tying cord 1,4 in first square knot with 2 fillers (cord 2,3 are fillers). Next, tying cord 3,6 in second square knot with 2 fillers (cord 4,5 are fillers). Then Tying cord 1,4 in third square knot with 2 fillers (cord 2,3 are fillers).Now you got a triangle pattern of alternating square knots. Repeat the same method on the right group. 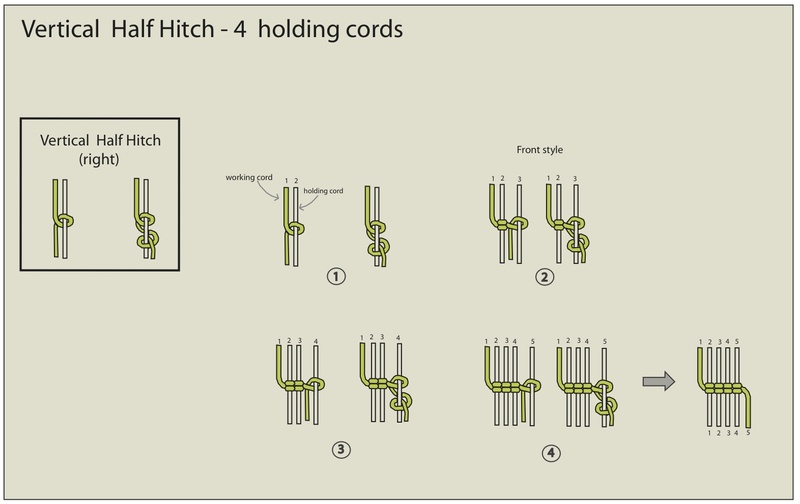 On the left group, Use the eighth cord from the left (brown cord), tying vertical half hitch to the left. This is the first vertical half hitch bar of brown cord. Tie the second of vertical half hitch bar, Use the same method above. Now you got 2 bars of vertical half hitch in brown color. Start with left group. Tie the double half hitch bar, the holding cord will be the 10th from left side (the left side of square knot in the middle), tie the holding cord to the left. Then work on the right group. Tie the double half hitch bar, the holding cord will be the 10th from right side (the right side of square knot in the middle), tie the holding cord to the right. Tie the cord in the middle with square knot without fillers. 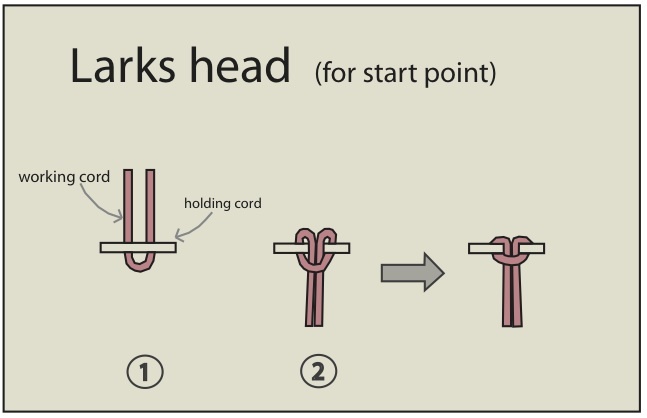 Repeat step 5 , but tie only 8 double half hitch knots (left the holding cord in step 5 which is leftest and rightest cord). Work on cord 1-12 in the picture. Tie cord 4,9 in square knot , the fillers will be cord 5-8. Tie cord 1,4 in square knot , the fillers will be cord 2-3. Tie cord 9,12 in square knot , the fillers will be cord 10-11. Thread brass bead in the 7th cord. Tie cord 3,6 in square knot , the fillers will be cord 4-5. Tie cord 7,10 in square knot , the fillers will be cord 8-9. Bring 2 cords in the middle (cord 5,6 which are below the brass bead), tie them with square knot without fillers. Thread brass bead in the 6th cord. Then tie cord 4,9 in square knot , the fillers will be cord 5-8. Work on the left group.Tie double half hitch bar, the holding cord is the second cord from the left (the same holding cord from step 6). Tie the holding cord to the left. Then work on the right group. Repeat the same method above but reverse pattern. Now the holding cord on the left and right group are in the middle, tie them in the square knot without filler. Repeat step 10 , But the holding cord will be the leftest and rightest cords ( the same holding cord from step 5). Work on the left group. Use the left brown cord tying vertical half hitch to the left. Switch to work on right group. Use the right brown cord tying vertical half hitch to the right. Then bring the brown cord in the middle tying square knot without fillers. Now you got first vertical half hitch bar of brown cord. Repeat the same method above to make second line of brown vertical half hitch bar. Work on the left group. Thread a shell or bead in the left cord. Tie half hitch knot around the cord and pull it firmly to lock the shell. Bring this cord tying double half hitch to the right. Switch to work on right group. Repeat the same method above but reverse pattern. Then bring the middle cord tying square knot without fillers. Using 2 middle cords, thread the left cord into the hole of cotton puff, pull it to the right. Then tread the right cord into the hole of cotton puff, pull it to the left. Pull this 2 cords firmly until the cotton puff close to the pattern. Tie 2-3 square knots around the space between top of cotton puff and bottom of pattern. Cut every cords. Burn them and keep the burning spot at the back of your work. To make a necklace line. Work on right side, tread a small wooden bead into 3 cords. Tie the knot to lock bead. Weave 3 cords in chain until reach your prefer length, you may add some spiral stitch knots if you like. Repeat the same pattern with 3cords on the left side. Tread a medium wooden bead into 6 cords, this is making necklace adjustable. There are 3 cords on each side of the ending.Tread bells and tear drop shape bead as in the picture into 1 cord. Use the same cord tying 1-2 knots for locking. Tie 2-3 square knot around the chain for closing, cut and burn the end. The necklace can be adjustable by pulling the wooden bead. Can you tell me where you buy your wax cord? I can't find any that are shiny like yours, only dull:( Beautiful work by the way. Thank you for sharing!